Before the tournament began, India versus Belgium was billed as the most important match of Pool C in the 2018 Hockey World Cup. Living up to those expectations, both teams played out a thrilling 2-2 draw at the Kalinga Stadium in Bhubaneswar. In front of a packed arena, the riveting encounter saw some exhilarating and fast-paced hockey. Belgium began strongly and earned an early goal through a pinpoint penalty corner from Alexander Hendrickx. At the half-way mark, India appeared to be under pressure as their strikers had missed quite a few opportunities. However, the hosts got their act together in the third quarter and started to retain more possession. Varun Kumar's penalty-corner earned a penalty-stroke and Harmanpreet Singh duly leveled the scoring. Kothajit's deft pass and Simranjeet Singh's clinical finishing helped India take a 2-1 lead at the beginning of the final quarter. But Simon Gougnard took advantage of some chaotic defending and scored a late equaliser for Belgium. Considering the Red Lions' higher ranking and their very own superior goal difference in the tournament thus far, the Men in Blue should emerge as the happier team from the stalemate. Here are three reasons why India drew 2-2 against Belgium. 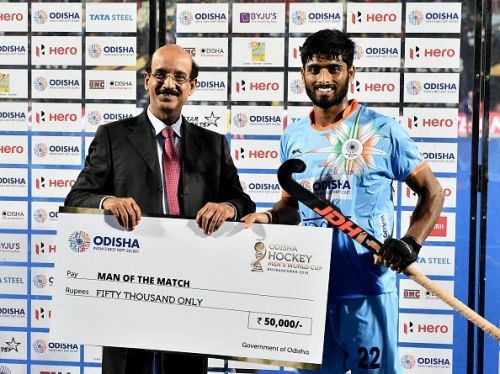 Having been a key part of India's triumphant campaign in the 2016 Junior Hockey World Cup, a lot was expected from Varun Kumar against a well-oiled unit like Belgium. Preferred over much more experienced defenders, the 23-year old vindicated coach Harendra Singh's bold decision. Right from the start of the game when Belgium looked in an ominous mood, Varun appeared unruffled at the back-line. Showing remarkable composure, he predicted the attackers' moves and dealt with advancing threats in an admirable manner. With Harmanpreet Singh off the field for a brief while, the onus fell on Varun to make something happen from a penalty-corner in the third quarter. He extracted a rare penalty stroke with his rapid shot at goal. Although Harmanpreet got in on the scoring sheet at the 39th minute, the first goal was very much a product of Varun's perseverance. He was deservedly rewarded with the Player of the Match award.